Brenda Brue holds up a ŒClose Tallulah¹ sign Tuesday as lawmakers on the Senate Judiciary B Committee voted to do just that. 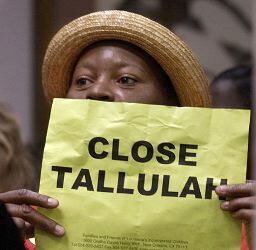 Senate Bill 963 would close the juvenile prison at Tallulah by June 30, 2004. The Senate Judiciary B Committee voted 6-1 to close it as a juvenile facility by June 30, 2004, while still allowing the state Department of Corrections to find some other use for it. Senate Bill 963 also allows some money earmarked for the prison to be spent on community-based efforts at rehabilitation. The bill goes to the full Senate for debate. "This is a real step," said Gina Womack of New Orleans, who came up with a group of family and friends of imprisoned juveniles. Eyes brimming with tears, she said after the meeting that she's glad to see the state take some action on juvenile justice reform. "It's amazing. We're very happy," Womack said. "We worked very hard for this." Juvenile system reform supporters made up most of the crowd in the State Capitol committee room and the group in the hall outside. They wore stickers and held up signs. One sign said: "Stop state-sponsored abuse of our children." Committee Chairman Sen. Don Cravins, D-Arnaudville, made it clear he had enough of delays on shutting Tallulah's Swanson Correctional Center for Youth-Madison Parish Unit in the extreme northeast part of the state. "This institution seems to symbolize the problems with the juvenile justice system in Louisiana," he said. Questions and problems have dogged the Tallulah prison almost since it opened in 1994, said David Utter, executive director of the nonprofit Juvenile Justice Project of Louisiana. The privately run prison's short history includes a riot almost as soon as it opened, a state takeover in 1999, allegations of physical abuse and questions of the propriety of the contract between the state and builder/manager Trans-American Development Associates Inc.
A 2001 legislative auditor's report showed the owners had made nearly $9 million in dividends and salaries since 1995. "It served three people," Cravins said of the juvenile prison. "It ruined the lives of hundreds of young people. We don't need Tallulah to punish them. We need to stop skirting the issue of this illegal act that occurred in 1994." State Sen. C.D. Jones, who represents the Tallulah area, cast the lone vote against closing the juvenile prison. Jones, D-Monroe, said some of the problems at Tallulah are not unique to Tallulah. "I certainly don't want to suggest in any way that I'm not interested in the protection of our children," he said. Jones, saying he also was looking out for the 300-plus employees of the facility, suggested changing the mission to handling offenders age 17 to 21 who have been sentenced as adults. The committee voted against that provision. The big problem in the juvenile system is population density, cautioned Elijah Lewis, assistant secretary for Youth Development for the state Corrections Department. He suggested that closing the Tallulah prison would push more juvenile prisoners together in closer quarters elsewhere. Cravins told Lewis that, after three years of discussions and studies, the Legislature has to act. "I believe the only way you are going to comply with the will of the people of Louisiana is if you are forced to do it by legislative act, period," Cravins said.